In September of 1958 a group of friends, all with a passion for cars, decided to form a car club. Not just an ordinary car club, but one where the members didn’t need to own a classic automobile. Simply having a passion for cars, trucks or motorcycles was enough to warrant membership. When choosing a name for the club, one member remembered his mom saying, “We were all angels. We just strayed at times,” and so they became the ‘Stray Angels’. The Roseburg Moose lodge became the first sponsor of the Stray Angels car club. This allowed members of the club to begin helping with a program that aided in taking voters to the poles, in addition to various charity events. In the early 60’s the club became secondary in the lives of the members as most began joining the service, going to college, and getting married. In the early 70’s, they figured since they weren’t going to grow up anytime soon, they should start involving their children. A reunion was planned to see if there was enough interest and commitment in keeping the club going. The interest was strong and in the early 80’s, they started involving new members and once more began working with local charities and other community events. In 1982 the Stray Angels helped organize Roseburg’s first Graffiti Night Cruise, which was held on Harvard Blvd., cruising between Pete’s Drive-in and the A & W restaurant. 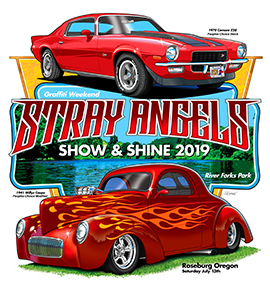 The event was such a success, the next year Stray Angels members decided to host a Show-n-Shine at River Forks Park. This provided someplace for those that came to the cruise a place to park, show off their cars and visit. The first year the Show-n-Shine hosted 125 cars and has since grown to nearly 600. The Show-n-Shine has been held in conjunction with the Graffiti Night Cruise ever since. The original Graffiti Night Cruise has since seen major growth and development over the years, becoming Graffiti Weekend, and a major attraction to Douglas County. The Stray Angels club members pride themselves with carrying on the traditions of helping their community. Some programs the Stray Angels are involved with are: UCAN food bank, Douglas County Special Equipment Fund, Douglas County Cancer Services, Doernbecher Children’s Hospital, Special Olympics, Muscular Dystrophy Association, Heart Association, Rotary, and Lions Club. Even today there are members without a special interest vehicle. Other member vehicles vary from stock, contemporary, custom, and street rods. 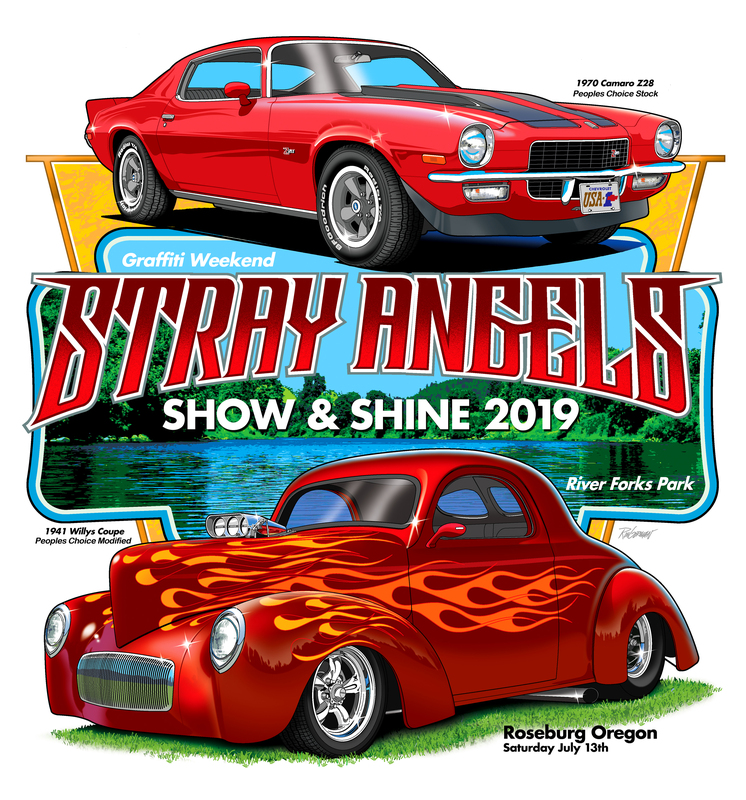 The key to being a member of the Stray Angels is not about owning a car, but having an interest in the car hobby and an interest in the community. The Rest & Retirement Home Tour, also known as the “R&R Tour,” came into being in the late 90’s. One of the Stray Angels members had a mother living in the Garden Valley Retirement Center. She was disappointed that she and her fellow neighbors could no longer join in the festivities showcasing the cars of their youth, due to decreased mobility and having to use walkers or wheelchairs. This amazing mother had the grand idea of bringing the classic cars to those that couldn’t get out to the event itself. The R&R Tour started with one retirement home and has grown to 13, and in 2014 three adult foster homes were also added to the tour.